A vegetable, and an exfoliator! My grandmothers, like yours too, if they were a part of the same generation, practicised thrift to a fault. They had to, really, with large families and very limited sources of income. I always felt that the petenkar or luffa that grew along the the backyard wall would merit their approval, as it served as both food and those that were dried out over time would be used as a luffah or body exfoliating sponge. I feared those dehydrated, scratchy cucumber shaped sponges that looked like the fossils of alien creatures. If you’ve used one (and you’ll find luffahs at your nearest health and beauty store), you’ll know how hard they can feel to the skin of a child. It does look impossible to clean, but you actually don’t need to remove too much off the skin. 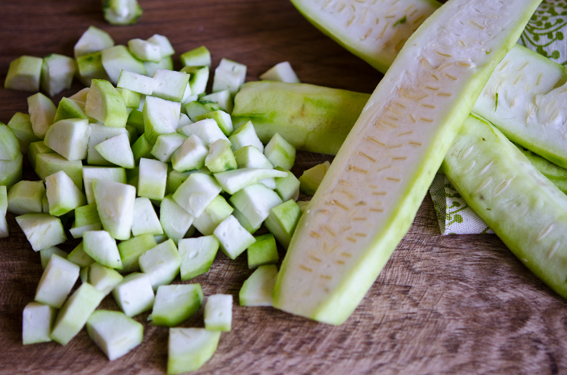 In this recipe I have removed most of it with a sharp vegetable peeler, but my mother removes much less – this adds a lovely crunch to the cooked result. The skin is used in South Indian recipes to make a spicy cooked pesto. Usually, we prepare luffa with dried shrimp. 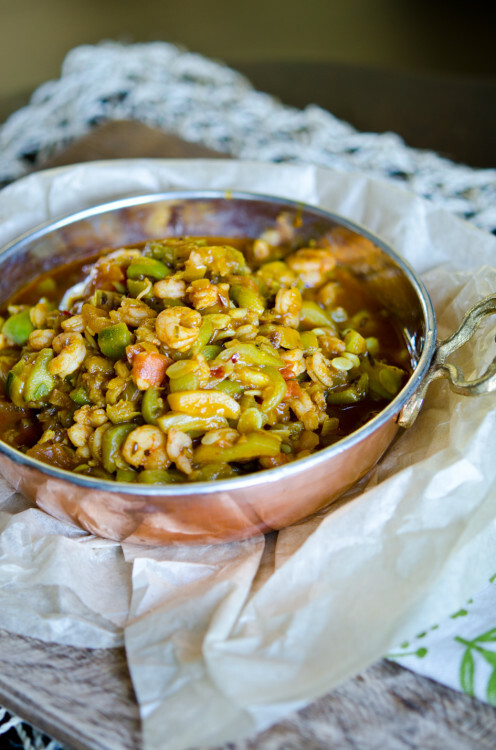 I’ve used regular shrimp in this recipe. 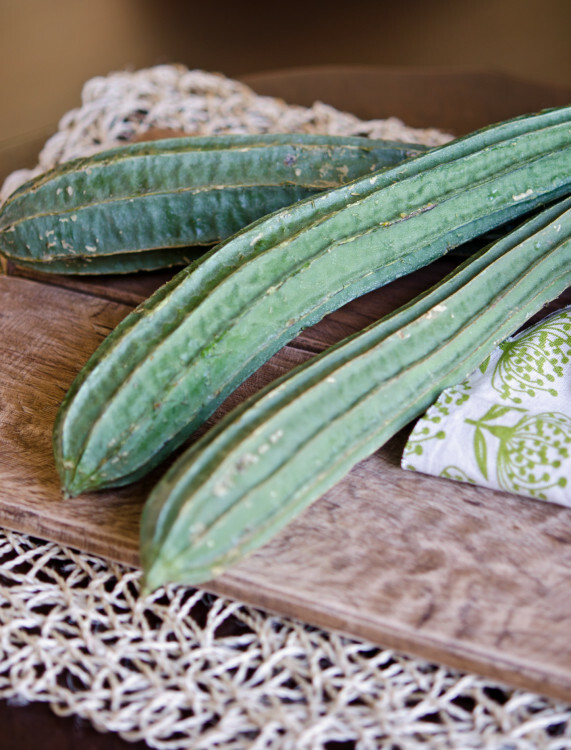 Substitute the luffa if you can’t find any for large marrow, cubed, salted and drained. 1. Clean luffa by removed green skin with a vegetable peeler. If there are many seeds, cut some of them away. Cut into small cubes (2cm), salt and leave in a colander to drain for 20 minutes, shaking from time to time. 2. Heat ghee and oil in medium sized pan, add onions, fry on medium heat for 5 minutes until starting to brown. 3. Add coriander, fenugreek, cumin, green chilies and fry on low heat for 2 minutes. 4. Add masala and turmeric for cook for 20 seconds, stirring. Add drained luffa and cook for 10 minutes on medium heat, stirring to mix. 5. Add diced chopped tomato, allow to cook for 5 minutes. Add the shrimp, salt and mix through. Cook on low heat until prawns turn pink, should take 3-4 minutes. Add the vinegar and adjust seasoning. 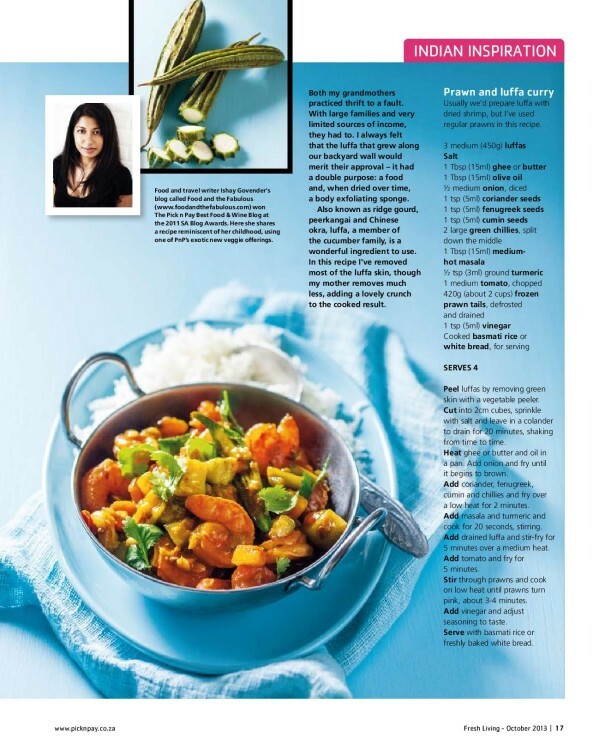 Serve with basmati rice or freshly baked white bread.